SAN JOSE, Calif.--(BUSINESS WIRE)--Western Digital Corp. (NASDAQ: WDC), a global data storage technology and solutions leader, today announced that it has successfully developed its next-generation 3D NAND technology, BiCS4, with 96 layers of vertical storage capability. Sampling to OEM customers is expected to commence in the second half of calendar year 2017 and initial production output is expected in calendar year 2018. BiCS4, which was developed jointly with Western Digital's technology and manufacturing partner Toshiba Corporation, will be initially deployed in a 256-gigabit chip and will subsequently ship in a range of capacities, including a terabit on a single chip. The company also highlighted strong ongoing operations at its joint venture manufacturing facilities in Japan. In particular, the company reiterated its expectation that in calendar year 2017, the output mix of its 64-layer 3D NAND technology, BiCS3, will comprise more than 75 percent of its overall 3D NAND bit supply. The company now believes that, along with its partner Toshiba Corporation, the combined 64-layer 3D NAND bit output of the joint ventures in calendar year 2017 will be higher than any other industry supplier in calendar year 2017. 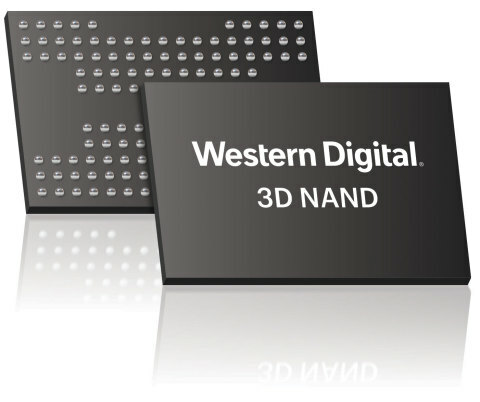 This news release contains certain forward-looking statements, including expectations for 3D NAND technology, including its development, timing for initial output, commercial volume production, product sampling and shipment, capabilities, performance improvements, applications, capacities, customers, Western Digital’s position in NAND flash and execution to its technology roadmap, operations at its joint venture manufacturing facilities in Japan and output mix of its BiCS3 that are based on current expectations. There are a number of risks and uncertainties that may cause these forward-looking statements to be inaccurate including, among others: volatility in global economic conditions; business conditions and growth in the storage ecosystem; impact of competitive products and pricing; market acceptance and cost of commodity materials and specialized product components; actions by competitors; unexpected advances in competing technologies; our development and introduction of products based on new technologies and expansion into new data storage markets; risks associated with acquisitions, mergers and joint ventures; difficulties or delays in manufacturing; and other risks and uncertainties listed in the company's filings with the Securities and Exchange Commission (the "SEC"), including the company's Form 10-Q filed with the SEC on May 8, 2017, to which your attention is directed. You should not place undue reliance on these forward-looking statements, which speak only as of the date hereof, and the company undertakes no obligation to update these forward-looking statements to reflect subsequent events or circumstances. 1 – 1GB = 1,000,000,000 bytes. Actual user storage less.